As you know, I followed my Recipe for Recovery and ultimately I was successful in recovery from Parkinson’s without medications. After I recovered, I no longer needed to do the Recipe for Recovery because I was fully recovered and I knew I was finished with Parkinson’s. On June 12, 2010, I awoke with my final Parkinson’s symptoms gone. I had fully recovered. That night, I poured a glass of wine for myself and one for Sally, and I asked her to join me in a toast of gratitude for recovery. She seemed a little surprised because I had given up alcohol during recovery so my liver would have the optimum opportunity to heal and function at full capacity. 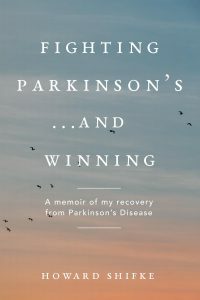 I told her, “I am finished with Parkinson’s and it is never coming back.” With that knowledge and faith, I have proceeded forward these last nine months, and I have not done the ingredients of the Recipe for Recovery except when I am coaching others through it. Every day, I do the Qigong exercises I did prior to Parkinson’s and I do daily meditations and praise like I did prior to Parkinson’s; I have added some dairy back into my diet, a diet which remains vegetarian because I grew to enjoy the vegetarian diet, not because I feel I have to maintain a vegetarian diet not to get the disease back; I have added an occasional alcoholic beverage back into my life, and have added back in the occasional sugary desserts I skipped for nine months. Am I back to my “old” self? Not a chance. My old self is what helped Parkinson’s rear its ugly head and wreak havoc over me. My new self is a Parkinson’s-free self, better than the old self. It is why I needed to be fighting Parkinson’s drug free without medications or supplements or herbal remedies or Ayurvedic formulas. I needed to “know” the disease. I needed to know how it was embedded in my body and my mind and my soul. I needed to know how it reacted to my actions. I needed to know what were the causes. It was not good enough to know what were the symptoms…removing the causes was the key. If you read the introductory remarks to the Recipe for Recovery, you will see how I identified the causes and how I fought to eradicate the causes. This is what I mean when I say my focus was not on feeling better, it was on getting better. If you medicate or mask the symptoms, you feel better. If you eradicate the causes, you recover. And when you recover, you know in your heart and soul it is never coming back. This entry was posted in Fighting Parkinson's Drug Free and tagged Fighting Parkinson's, it's not forever. Bookmark the permalink.